PXI Chassis, 6U Chassis - GX7000 | Marvin Test Solutions, Inc. 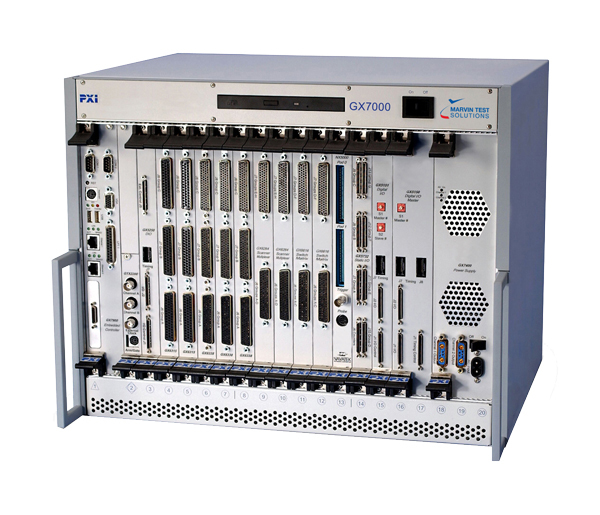 The GX7000C Series are high-performance 20-slot PXI chassis that can accommodate up to 19 instruments as well as a PXI controller (an embedded CPU or a PXI bus expander interface such as the MXI series). The 6U form-factor provides the necessary real estate to accommodate high performance and high-density test instrumentation, while offering the flexibility of being able to use 3U PXI and cPCI instruments as well. The GX7000C Series offers a full range of features and options including a high power (4.5 KW) system power supply configuration, as well as configurations that support embedded or external system controllers. The GX70x0C and GX70x2C models provide forced-air cooling which is generated by four (4) 52 CFM fans mounted under the card cage — providing positive airflow per the PXI specifications. This configuration provides the optimum cooling for the chassis regardless of the type or number of instruments used. Additional cooling is provided for the power supplies. The GX7005C chassis offers a high power (4.5 KW) system power configuration for high performance digital test applications. The chassis includes eight (8) 100 CFM fans, providing positive airflow per the PXI specification. The chassis includes additional VCC and VEE power supplies to support the GX5960 and GX5055 digital subsystems. The GX7000C Smart Chassis supports the monitoring of slot temperatures and system power supply voltages as well providing the ability to program or map each PXI trigger line from one PCI segment to another. In addition, the user can program the temperature monitoring function for specific warning and shutdown limits as well as monitor / control fan speed. All user specific setups can be stored in non-volatile memory as a user configuration and can be used as the default setup for normal chassis operation. The GX7000C supports mass interconnect interfaces from several manufacturers including Virginia Panel, MacPanel, ITT Cannon, and others via the GX7500 Universal Receiver Interface. For applications requiring mass interconnect and cable routing to / from the rear of the chassis, the GX7002C and GX7012C offer the ideal system solution. These chassis include an integrated 2U cable tray, a hinged front-panel that accommodates all popular mass interconnect devices, optional openings at the top & bottom of chassis for cable routing, and recessed PXI instruments (recessed by 2.5" or 5"). In combination, the front panel and recessed instruments provide up to 8" of space for interface wiring. The chassis is supplied with the GxChassis software which provides software libraries and a driver, programming examples, a virtual panel application and documentation. The virtual panel provides a way to control, configure and display the smart chassis' features, including temperature monitoring, trigger line mapping, fan monitoring / control, and power supply voltage monitoring. A 32/64-bit Windows DLL driver is provided with various interface files for accessing the DLL functions from programming tools and languages such as ATEasy, LabVIEW, C/C++, Microsoft Visual Basic®, Delphi, and more. A User's Guide provides documentation that includes instructions for installing, using and programming the chassis. Support for Linux for the chassis is provided using a separate software package - GtLinux. Status: Query via software driver and audible alarm for a warning limit condition. 20 slot PXI Slave 6U Chassis with 900 watts power & a flat front panel, card cage recessed 5"